November 14, 2018 –EVERLEGAL acted as a partner of the III Legal Energy Forum 2018, where the leading energy experts shared their views on the topical trends and important issues in the energy sector of Ukraine. Andriy Olenyuk, partner at EVERLEGAL and the head of the Renewable Energy Practice presented on the topic of "Legal Support of the Development Process: Structuring Considerations in the Renewable Energy Sector ". Andriy shared his experience from work with the Ukrainian developers and foreign investors as well as his vision of the role and functions of lawyers in the development projects in the sector. 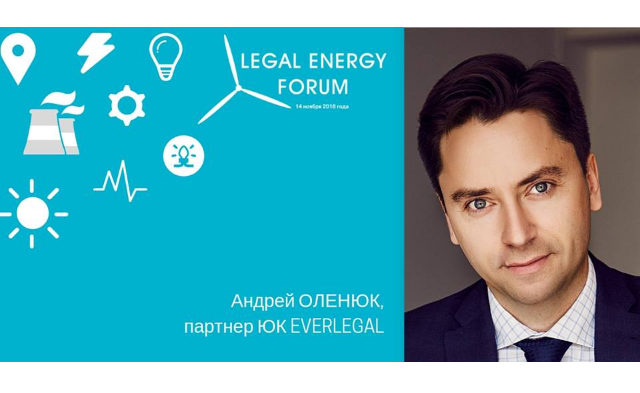 Legal Energy Forum - one of the key energy forums in Ukraine, which annually organizes the Ukrainian legal edition Yuridicheskaya Praktika (Legal Practice).